Facebook users be sure to Like us! Welcome to the Scrambler Owners Association! Founded in 2002, the Scrambler Owners Association (SOA) is a group of people who all share a passion for the "long Jeep"—the CJ8 Scrambler. The goal of the SOA is to promote fellowship within the Scrambler community and knowledge about these interesting and rare Jeeps. We are a close-knit group of people that enjoys the company of other members, getting outdoors in and working on our Scramblers. Membership is open to anyone who owns a CJ-8. 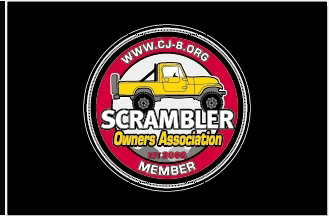 If you or someone you know is interested in obtaining more information about the Scrambler Owners Association, please feel free to email us at info@cj-8.org. The SOA supports Tread Lightly and is a non-profit corporation under the laws of South Carolina. The new Scrambler Owners Association Trail Flag is available from ForeverWave.com.